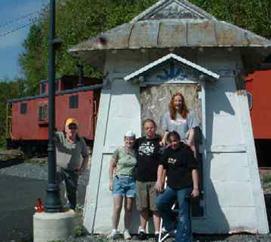 Photo: Tamaqua Area Leo Club assists with “Watchbox” restoration. Pictured Left to Right: Bill Yost, Tamaqua Lions, Amy Kabana, Jared Schuetrumph, Erica Dolan and Jule Cooke. Call (570) 668-2770 for more information if you are interested in volunteering. High school students and National Honor Society members can earn community service hours by helping out the Station. The station may be “saved”, but your help is still needed! volunteer your time or to donate.